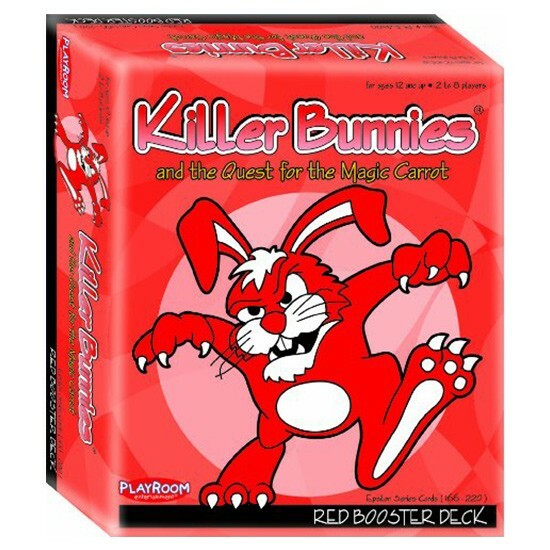 Killer Bunnies are back, and no one is safe with new Red bunnies, each having a special power!The Red Booster Deck adds 55 cards to your existing set, plus a Red twelve-sided die. Other fantastic new cards include:Rooney's Weapons Emporium to give players a second Killer Bunnies market to buy back used weapons, Defense Cards to eliminate weapons, Barriers to protect your bunnies from Roaming Red cards, and four new Carrots - now there are 16 to collect! Can you defeat the Quite Irascible Diffractable Cheese Balls?Can you even say Quite Irascible Diffractable Cheese Balls?Send bunnies three rounds ahead with Bunny to the Future!The laughs continue as this wild and wacky Red Booster Deck delivers more intense strategy and even more Carrot grabbin' fun!